With several MLB teams signing multi-billion dollar television contracts, business is good for baseball owners. Despite plummeting national TV ratings and flatlining or declining local ratings last season, local TV money has gone berserk. How is MLB able to do it? Part of the answer is not something the owners want publicized: it is baseball’s antitrust exemption. Antitrust laws are statutes developed by the U.S. Government to protect consumers from monopolistic business practices and ensure fair competition exists. Or, as the Federal Trade Commission describes it, “These laws promote vigorous competition and protect consumers from anticompetitive mergers and business practices.” (2) These laws were made official by Congress through the Sherman Antitrust Act in 1890. The Phillies have their new broadcast team, adding Jamie Moyer and Matt Stairs to the booth. Guess they weren’t old enough for Amaro to add to the Phillies 40-man roster – oh snap! Jamie Moyer has forgotten more about pitching than I will ever know. I would love to spend the day/week/month with Jamie Moyer. Wait...don’t laugh...it’s not what you think...I want to talk pitching with him. Anyhow, he brings a lot of smarts to the table. But I remember him as being a nice guy but really, really boring. We’re talking boring enough to plan naps around boring. Some players act completely different when they are no longer playing, but I'm not so sure that is the case with Jamie Moyer. Matt Stairs is the exact opposite. He is a guy I would love to hang out with for about 4 hours a night/2 days a week/between the hours of 10 pm and 2 am/on the days between Thursday and Sunday. I mean, the dude pounded 2 beers simultaneously at the Wing Bowl. And he smashed quite possibly the biggest home run in Phillies history. Hey, it's not our money. Thus concludes my analysis of the AJ Burnett signing. That is way oversimplifying things, but for a team likely contending for no more than third place, as long as Burnett doesn't cost prospects and won't affect the team after this season, the Phillies can waste their money however they want. That is a big part of why I like the Burnett deal. The Phillies are better today with the addition of Burnett than they were one day ago. Questions of how much better and does it even matter offer an interesting debate. 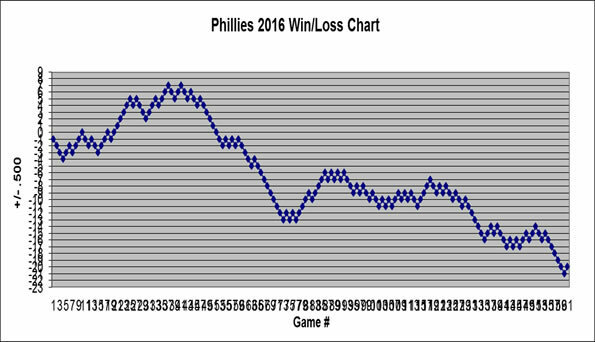 On the low end of the scale is Keith Law's Phillies Flounder with A.J. Burnett Signing article (requires Insider subscription) in which he thinks the team was so awful to begin with, the signing won't make a hell of a lot of a difference. On the other end is Corey Seidman's opinion that "the addition of Burnett alters the Phillies' entire offseason." Which opinion is correct doesn't really matter because the Phillies' entire offseason philosophy was little more than hoping to get lucky enough with injuries to keep some fans in the seats. AJ Burnett's contract is now official at 1 year/$16 million with a $15 million mutual option in 2015. If the Phillies decline the 2015 option, Burnett can exercise a player option for $7.5 million that can escalate to a max of $12.75. His 2015 player option is troubling. His option ensures that if Burnett pitches poorly and/or is hurt, the Phillies are guaranteed to pay a 38-year-old pitcher $7.5 million in 2015. Roy Halladay is a likely Hall of Famer who was the runner up for the Cy Young Award just three years ago and at age 36 is still with the Phillies...as a guest instructor. The Phillies have already agreed to pay Burnett a minimum of $7.5 million when he will be two years older than Halladay was last season. It may sound like I am pinching pennies here. I mean, c'mon, it is $7.5 million for a team that just signed a $2.5 billion TV deal. But $7.5 million severely limits the Phillies options next season. If the contracts for Rollins and Adams vest and we include the roughly $10 million for player benefits, the Phillies are already locked into $146.5 million towards the luxury tax for 10 players next season. That leaves them with $42.5 million for the remaining 15 players on the active roster before Burnett. But Burnett's $7.5 million drops the Phillies available money under the luxury tax to $35 million for 15 players. "The majority of contracts for arbitration-eligible players are non-guaranteed, but Phillies assistant general manager Scott Proefrock said the team extended guarantees to both. Mayberry signed for $1.5875 million this winter while Frandsen agreed to a $900,000 deal. It is possible the Phillies saved money when signing both players by including the guaranteed language." This has to be a joke. I mean, seriously, the Phillies felt the need to guarantee a contract to John freakin' Mayberry? It is beyond comical at this point. My good buddy Maybuggles hit .227 last season and finished with a -1.1 WAR which ranked him #230 of 237 players with at least 350 plate appearances. I recently did the unthinkable and…gasp…cancelled my cable. I watched my Comcast internet and cable bill drop $53 - now all I pay is 8 bucks for Netflix. For a cheap guy like me, there is no greater feeling. Of course, I will come crawling back to Comcast in April, begging them to accept my 53 dollars again. Why? Oh, that is simple. If I want to watch the Phillies I have no other choice. Welcome to Major League Baseball’s blackout rules; a maddening display of how MLB chooses to run their business – preying on the very consumers who pay their bills. Not that this is a surprising revelation. Baseball has conducted business in this fashion all along, taking advantage of an absurd antitrust exemption which allows them to do…well…whatever they want. Their multi-billion dollar (yes, billion with a ‘b’) TV deals show how easy it is to make money if you don’t need to worry about those burdensome things called ethics. Baseball is making the kind of cash from their local TV deals to make Scrooge McDuck blush: $8.5 billion for the Dodgers, $3 billion for the Angels, $2.5 billion for the Phillies, and $1.2 billion for the Padres, just to name a few. Don’t mistake these deals as the result of incredible demand – baseball’s attendance, national ratings, and local ratings are actually flat or declining. Instead, these dramatic increases are a response to the reality that live sports are one of the last remaining vestiges in television with a near DVR immunity. The networks and cable companies know this and are trying to reel in the piles of cash while they still can. Baseball could not reap such rewards without their exploitative broadcast policies which not only affect baseball fans, but every cable and satellite subscriber in America. So this article is designed to do a few things. I will first give a little background on blackouts and explain how they work. Then I will show how Major League Baseball, with a little help from regional sports networks and cable/satellite providers, is exploiting everyone. Finally, I have the potentially great news of a lawsuit from a bunch of fans that could change everything.